Joe Callahan's fate will likely come down to Carson Wentz's health. 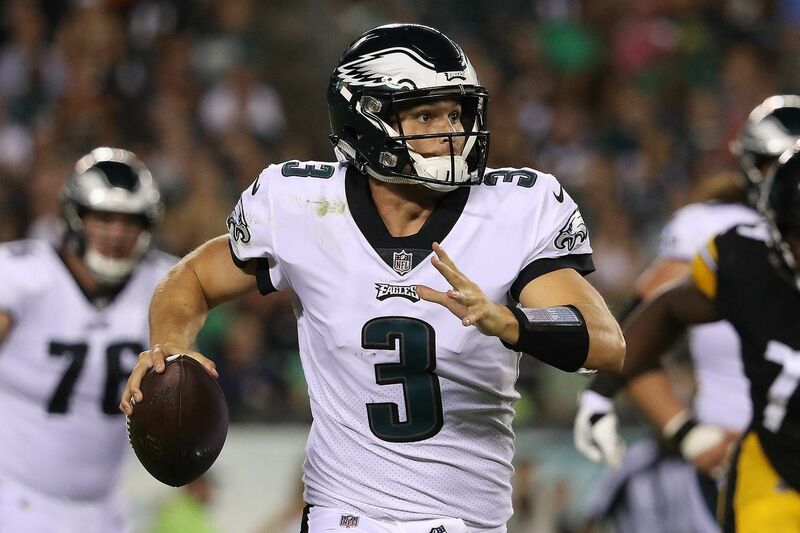 Among the many people eagerly awaiting news on Carson Wentz's health heading into the Sept. 6 season opener is Joe Callahan, the Eagles' fourth quarterback. Callahan, 25, has been waived more often than the right to remain silent — six times, by three teams, since arriving in the NFL from Absecon, N.J., and Division-III Wesley College in Dover, Del., as an undrafted rookie with the Green Bay Packers in 2016. Lucky No. 7 figures to arrive this weekend unless the Eagles decide that Wentz isn't ready to play against Atlanta, and that they need Callahan on the roster to back up Nick Foles and Nate Sudfeld. NFL teams will cut down from 90 to 53 players by 4 p.m. Saturday. Of course, even if that spot opens up, the Eagles brought in a QB with a more distinguished pedigree a few weeks ago in Penn State's Christian Hackenberg, and even though Hackenberg is more than three months behind Callahan in learning the Eagles' offense, he is bigger (6-foot-4, 228, vs. 6-1, 216) and has a stronger arm. Callahan and Hackenberg will do most or all of the quarterbacking for the final preseason game, a Thursday night visit from the New York Jets. One of them could end up going through waivers and emerging on the Eagles' practice squad. Hackenberg has never been on a practice squad since arriving in the NFL as a 2016 second-round pick of the Jets, but Callahan certainly has — twice with Green Bay, for parts of the 2016 and 2017 seasons. "I'm not sure what their plan is, the medical decisions going on right now," Callahan said. "I just know that I have to go out there and execute and just put my best game out there, and if it doesn't result with me staying with the Eagles, hopefully, I end up somewhere else." Do you get used to uprooting and starting over, after you've done it a certain number of times? "No," Callahan said. "It's never a fun day, getting waived. But that's the life of an NFL player who's fighting to make rosters." This preseason game is always a snoozer for many fans since starters don't play. But if you're Joe Callahan, who knows when or if you will take the field in an NFL uniform again? "Obviously, everybody knows what comes along with this game and the preseason ending," Callahan said. "There's gonna be a lot of roster moves, especially with the younger guys. You just have to make sure you're on top of your preparation, so you can just pin your ears back and play, and then hope for the best." If Callahan can spend even a few weeks on the roster, that would be valuable – he has a two-year, $1.35 million contract. Every regular-season week garners a little more than $37,000. The practice squad minimum for 2018 is much less, $7,600 a week. Callahan has completed 10 of 21 passes this preseason for 98 yards – only 4.7 yards per attempt – with no touchdowns and no interceptions. "We haven't really seen much of them, either one of them," coach Doug Pederson said Tuesday, when asked what he is looking for from his QBs against the Jets. "Christian obviously hasn't played in a game here; Joe played a little bit in the first two games. Really just overall execution; just how well they can process the information. … Joe has obviously been here the longest, so how well can he process the information and call plays in the huddle. It's a little different than a practice setting, or looking at it off of a card, servicing the defense [in drills], things of that nature." Callahan hasn't rocked the franchise's foundations with his training-camp play. He seems better when he's chased out of the pocket, throwing on the run. "He's fun to watch," said Wentz. "He's obviously kind of a gunslinger, a playmaker out there. It'll be fun to see him Thursday night." Callahan said being able to find receivers after the protection breaks down is "something we emphasized in Green Bay the last two years, and I've kind of made it a part of my game. When things break down, I'd like to try to extend the play." Callahan's parents made the trip from the Jersey Shore to Cleveland for last week's preseason game, but their son never got on the field. "That's how it goes sometimes," he said. Callahan said lots of friends and relatives will be on hand Thursday night at Lincoln Financial Field. This should be his most extensive Eagles outing. Callahan has worked with Aaron Rodgers and with Wentz. There is another guy at NovaCare who made a lucrative career, primarily as a second- or third-string QB, learning from starters such as Brett Favre and Dan Marino. That would be Pederson, who bounced around from Miami to Carolina to Green Bay to the Eagles, the Browns, and then back to Green Bay, over 12 seasons. "Hopefully, I have a career that lasts as long as his," Callahan said. So far, Callahan has appeared in one regular-season game, Week 17 last season, as the Packers lost to the Lions, 35-11. Callahan got the final two minutes and was given the option of running out the clock or trying a little two-minute drill work. He went for the two-minute drill and completed five of seven passes, for just 11 yards. Does he wonder when another such moment might arrive? "I'm hoping soon," Callahan said.